Naturally occurring radiation can be found all around us and account for most of the radiation received by human beings each year. Indonesia has a region with high-dose natural radiation located in the suburb of West Sulawesi province with a dose rate up to 2800 nSv/h; however, its impact was not fully understood. The aim of this study was to evaluate the radiosensitivity of 12 peripheral blood lymphocytes of inhabitant from high background radiation area (HBRA) and 10 from normal background radiation area (NBRA) based on cytokinesis-block micronucleus (CBMN) assay after challenged with 1.5 Gy of gamma ray. The analysis of CBMN was done according to standard procedure as per IAEA guidelines, and frequency of binucleate (mitotic) cells with micronuclei (MN) was scored in around 2000 binucleate lymphocytes cells per culture in microscopic analysis. 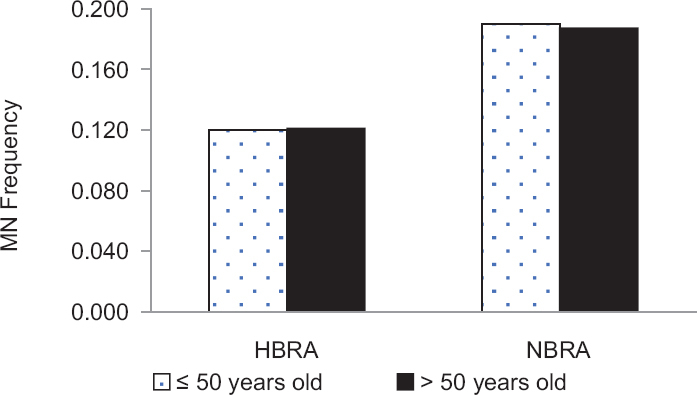 Mean MN frequency for HBRA was lower than that of NBRA (0.121 vs. 0.189) after irradiation, indicating an adaptive response in HBRA group that resulted in less radiosensitivity; however, there was no statistically significant different (P > 0.05) between these two groups. The MN number was higher in women compared to men for both HBRA (0.15 vs. 0.09) and NBRA (0.216 vs. 0.147) groups. Besides, there was no statistically significant difference (P > 0.05) in Nuclear Division Index (NDI), as measured in 500 metaphase cells with published formula, between HBRA and NBRA samples (1.24 vs. 1.21). The lower MN frequency prompts us to conclude that there is an adaptive response in the lymphocytes of inhabitants as an indicator of lower radiosensitivity to the high natural radiation exposure. Further studies using large number of samples are required to obtain more comprehensive conclusion along with the assessment of other types of radiosensitivity-related biomarkers. Nuclear anomalies of different types appear in cells in response to the action of ionizing radiation after the passage of the first mitotic division. In this article, we present the results of the study of the frequency of occurrence of three types of nuclear anomalies (“tailed” nuclei, nucleoplasmic bridges, and dumbbell-shaped nuclei) in vitro in human lymphocytes cultured with cytochalasin B when exposed to X-rays at doses of 0.0, 0.1, 0.2, 0.4, 0.5, 0.7, 1.0, 1.5, and 2.0 Gy. To stop the cell cycle of cultured lymphocytes after the first mitotic division, a cytokinesis block was performed using cytochalasin B. Dose-dependent curves of the occurrence of lymphocytes containing “tailed” nuclei, nucleoplasmic bridges, or dumbbell-shaped nuclei after irradiation have been constructed. 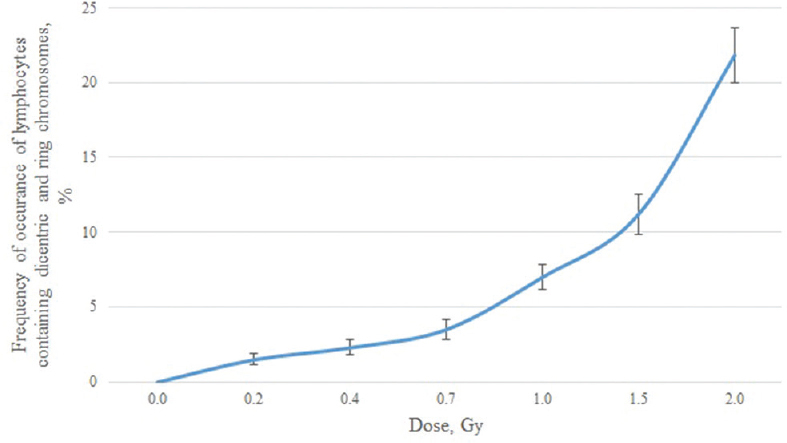 At the same time, frequencies of occurrence of chromosomal aberrations (dicentric and ring chromosomes) in the culture of lymphocytes exposed to the same radiation doses were studied. Comparison of the frequencies of occurrence of dicentric and ring chromosomes with frequencies of occurrence of nuclear anomalies allows us to conclude that these nuclear anomalies are formed as a result of chromosomal aberrations arising in lymphocytes under the action of ionizing radiation. More than that, most of the chromosomal aberrations are converted into dumbbell-shaped nuclei in vitro in the culture of lymphocytes in the cytochalasin block.